Description: This is a small and slender bodied goby with adults usually growing to approximately 6cm in length although some can grow to 9.5cm. It is a light sandy-brown colour with brown-black spots on the head and a dark reticulation on the back. Males have a conspicuous dark blue spot with a white rim on the posterior edge of the first dorsal fin and four reddish-brown cross-bars. There are four main vertical dark bars along the sides of the body and a dark triangular mark in front of the tail. 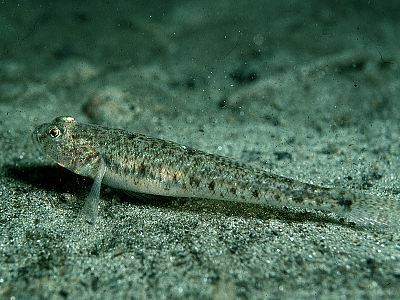 Habitat: As its name suggests the sand goby lives in sandy or muddy areas from the low shore to a depth of approximately 20m. Unlike the common goby it cannot tolerate the reduces salinities found in estuaries. It feeds on small crustaceans e.g. copepods and amphipods. Distribution: The sand goby is common and widespread all around the coasts of Britain and Ireland. Similar Species: This species is very similar to and often confused with the common goby (Pomatoschistus microps). They are both approximately 6cm long, grey to sandy brown in colour with darker reticulations on the back and a dark triangular mark in front of the tail. The males of the two species have a conspicuous blue-black spot on the posterior edge of the first dorsal fin. Underwater the two species are very difficult to distinguish, however the common goby usually has a triangular mark at the base of the pectoral which the sand goby does not. See also remarks on the painted goby (Pomatoschistus pictus). Picton, B.E. & Morrow, C.C. (2016). Pomatoschistus minutus (Pallas, 1770). [In] Encyclopedia of Marine Life of Britain and Ireland.